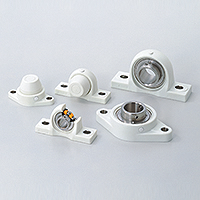 Information on various series of NTN bearing units with improved functions for applications that require properties such as housing rigidity, cleanliness, corrosion-resistance and ease of mounting. 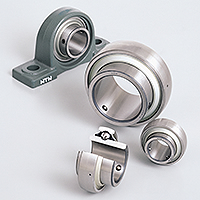 * See "rolling bearings" or "slide bearings" for individual bearings. 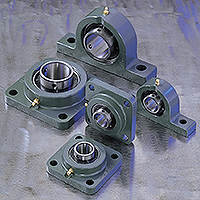 * See "plummer blocks" for units consisting of bearings with a self-aligning design and housing. Bearing boxes are made of ductile spheroidal graphite cast iron for improved breaking strength compared to gray cast iron. Dimensions are designed to be as compact as possible, making them suitable for applications with limited space and weight. Rolled steel housings for general structures are machined with precision gas cutting, ensuring higher rigidity compared to general cast steel. Their excellent load capacity and impact resistance make them suitable for parts where safety is a concern, or where there are high vibrations or impacts. Units combining a stainless steel housing and stainless steel ball bearings with improved corrosion resistance over general cast iron units. Heat-solidifying grease (polylube) in the ball bearings provide a clean environment and lower rotational torque. 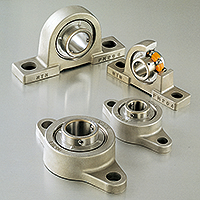 Units combining a resin bearing housing and stainless steel ball bearings for excellent corrosion resistance compared to cast iron units. Heat-solidifying grease (polylube) in the ball bearings provide a clean environment and lower rotational torque. 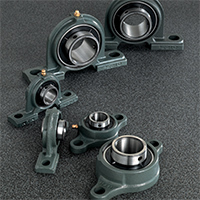 Contains a triple-lipped bearing seal for excellent dustproof and waterproof performance compared to standard bearings. This ensures a longer operating life even when subjected to dust or dirty water.